Nanoconstruction using nanoscale solder. (a) Touching nanowires can be joined using a nanoscale volume of solder melted from a sacrificial nanowire. (b) The word "NANO" written at the nanoscale by individual 55-nm-diameter gold nanowires. Adapted with permission from Nano Letters, ASAP Article, DOI:10.1021/nl8025339. Copyright 2008 American Chemical Society. 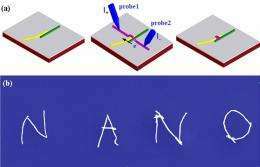 (PhysOrg.com) -- Scientists have discovered a way to link nanowires and other nanoobjects into complex nanostructures and circuits by fusing them together with tiny amounts of solder. The researchers, from Sheffield University in the UK, expect that their method could be used to fabricate nanoelectronic test structures for research or to repair interconnects or other defects in circuits. The process is a new form of nanowelding, which is similar to large-scale welding in that hot metal, or solder, is used to fuse the components together. The new technique may address an ongoing problem in nanotechnology research, namely the lack of successful ways to form bonds that are not only mechanically strong but can be easily tweaked to adjust the overall structure's electrical and chemical properties. The experiment, performed by researchers Beverley Inkson, Tony Cullis, and Yong Peng, is published in the December 10, 2008, online version of Nano Letters. In the paper, the researchers describe the nanowelding method in detail. For example, to fuse together two gold nanowires, the group positioned the wires such that their ends were touching but not their full lengths. Using a scanning electron microscope to view their work, they moved the wires with a nanomanipulator, a tiny specialized tool used in nanotechnology research to move nanostructures around, both mechanically and, by applying a current, electrically. They laid a "sacrificial" gold nanowire across the adjacent ends and electrically severed the sacrificial wire at two points, leaving a small bridge connecting the two nanowire ends. The bridge was welded into place by applying short voltage pulses with the nanomanipulator, inducing enough heat to fuse it to the nanowires. Inkson and her group also welded nanowires using another solder, a tin-gold alloy. This alloy is widely used in macroscopic welding because it has excellent conductivity, a low melting point, and large corrosion resistance. The group created more complex structures and networks with the gold nanowires, including the Chinese character for "human being" and the letters "N," "A," "N," and "O." Each structure was built on a silicon wafer. This nanowelding approach produces much better results than simply fusing together two nanowires without the use of solder, such as can be done by heating via an electric current, or "Joule heating." Currently direct Joule heating has only been successful in welding relatively large platinum nanowires as the method tends to cause significant changes in the nanowire shape, or even complete break-up of the nanowire, due to severe local over-heating. This research is published in the December 10, 2008, online edition of Nano Letters.